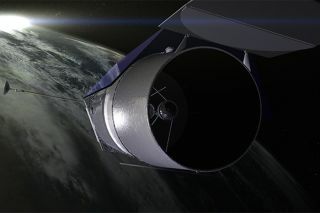 This is an artist's impression of the WFIRST mission in Earth orbit. Next month, NASA will begin work on its next major space observatory after the James Webb Space Telescope, which is finishing construction for launch in 2018. The new mission is called WFIRST (Wide Field Infrared Survey Telescope) and will investigate dark energy, exoplanets and galaxy formation. It is expected to fly in 2024. "Formulation is when we formalize the mission requirements," said David Spergel, co-chair of the WFIRST science definition team, in an e-mail to Discovery News. "An example of something that we will decide during formulation is the filters that we will use. We need to weigh the relative merits of being sensitive to bluer photons versus having sharper wavelength coverage … Improved blue sensitivity will help us better characterize the properties of stars in nearby galaxies, but possibly at the cost of less accurate determination of distance to galaxies through photometry." NEWS: Psst! What Would You Do With a Spy Telescope? WFIRST's advantage is its immense field of view. It uses an old, unflown spy telescope that has the same mirror size as Hubble — 2.4 meters — but a field of view 200 times wider. This will allow it to cover more sky at greater depth in the infrared than any observatory before, Spergel said. Additionally, a coronograph (an instrument that blocks light from bright objects) being constructed for the mission will be "orders of magnitude more sensitive" than other space coronographs, he said, allowing for exoplanet properties to be better understood. The mission will use a National Reconnaissance Office telescope, which was gifted to NASA a few years ago, while resurfacing the mirror and adding instruments and electronics. NRO actually gave two telescopes to NASA, but for the moment the second one will be used as a backup for WFIRST. WFIRST's formulation phase comes amid a budget boost from Congress, which approved a fiscal 2016 budget for the project of $90 million, more than six times NASA's $14 million request. WFIRST is also the top mission in the National Research Council's decadal survey of 2010, where astrophysicists were asked to identify their research priorities.